This grand beach house has been a favorite for generations. 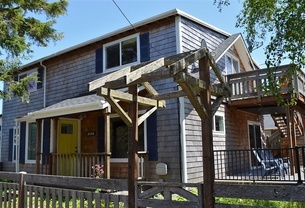 Downstairs offers an ocean view from the dining area, plus a fully appointed kitchen, living room, den, gas fireplace, bedroom with a double bed, a newly renovated 3/4 bathroom, and laundry room. Upstairs, there are four bedrooms (1 King and 3 Queens) and two newly renovated full bathrooms. There is also a “kids area” upstairs in the middle of the bedrooms with a flat screen TV, 2 twin bunk bed sets, plus 1 twin day bed with twin trundle bed underneath. The deck is perfect for a BBQ and has an ocean view as well. 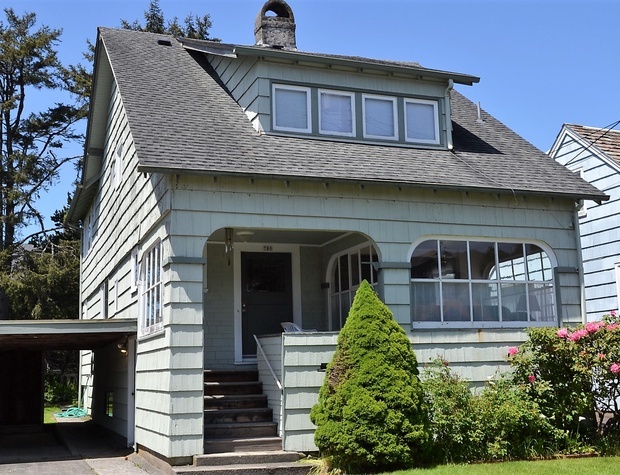 Only 3 blocks to downtown and just off the Promenade, this beach house is perfect for a retreat or family gathering and is also near several other large and smaller beach vacation homes. Parking for 4 cars.